Two years ago with rock still in its cradle two saxophonists with jazz backgrounds cast their fate with this new brand of unruly music. Needless to say their decision to do so wasn’t quite headline news. The music itself wasn’t yet known nationally by any name, hadn’t scored anything more than isolated local hits in a few areas, and though certainly groundbreaking stylistically in many ways there was still the chance it could be nothing more than a momentary blip on the radar, not even big enough to be called a “passing fad” should it die out by the end of the year. Instead by the time 1947 gave way to 1948 it was starting to draw some notice and those two sax players were a large reason why. Paul Williams scored rock’s first national instrumental hit that January and since that time has gone on to notch another seven hits including the single biggest smash rock has enjoyed to date and also played behind other artists on hits of their own giving him a greater presence on charts than any other artist in this field. Though Williams’s style at times could be a little conservative, at least compared to many of the honking sax maniacs who followed, he was unquestionably among the biggest rock acts of Nineteen Forties any way you looked at it. Then there’s Earl Bostic, arguably the most technically gifted musician (not just sax player) in rock music, who in those waning days or 1947 and the early minutes of 1948 did more than anyone, Williams included, to define the instrumental style as rock’s most flamboyant, exciting and at times harrowing sound, the very thing which would elevate the genre as a whole to the stature it now enjoyed. Yet Earl Bostic got just one hit out of his forays into this field and as of late he seems to have vacillated between sticking with rock and returning to his old flame, jazz, or more accurately a blander form of pop-jazz. So the question is: During that time did Bostic turn his back on us… or did we as rock fans turn our backs on him and force him to look elsewhere in search of commercial sustenance? In truth it was probably neither of those choices. As we’ve talked about in the past with a number of the more accomplished artists from other genres who’ve ventured into rock their choice to head into a new untested market had as much to do with a restless curiosity and non-conformist mindset in general as it did a deeper desire to break free of whatever constrictions they felt in jazz. That those moves proved so important in establishing rock’s credentials as a viable brand of music was what was so unexpected… to the industry and to them as well. So what happens when you find yourself caught up in a larger movement you might not have had any long term plans for? Do you stick with it, take advantage of your good fortune that might wind up with you becoming an unquestioned star in this field, or do you remain an iconoclast at heart, freely jumping from one style to another, determined to scratch each creative itch as it comes? We know that Bostic chose the latter. Though an admirable decision, staying true to himself and his whimsical nature, it’s proven to be a bit frustrating for us as rock fans who’ve watched the saxophone take over as rock’s most explosive and exciting instrument only to see its most skilled practitioner often sitting on the sidelines pursuing other avenues at the very moment when rock would’ve provided him with the biggest and most welcoming platform of his career. So maybe that’s why when we encounter a song like Platter Poppa which sits uneasily on the border of rock and jazz we’re more accommodating to include it here than we might otherwise be, almost as if by embracing it we’re furtively hoping to coax him back into the ranks of rock ‘n’ roll full-time while it was in his best interest to do so. 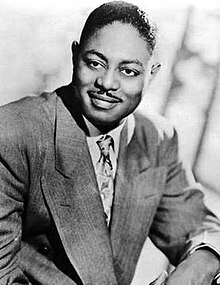 Let it be said right off the bat that no matter how good someone like Earl Bostic may be – and he was obviously fantastic – by 1949 his skill alone wasn’t going to be enough to be appreciated in the ever evolving world of black music. Oh, don’t get me wrong, he’d still be admired for his ability, but the music scene which had once been far more unified was splitting along class, age and cultural lines and by tailoring your appeal to one you’d risk alienating the other. He’d already done that of course when he abandoned jazz, the older, more respectable genre, one which had given African-American artists the most visible platform they’d had to date and which valued the technical skill that Bostic possessed above all else. It need not be said that what he abandoned it FOR – a little thing called rock ‘n’ roll – was a style that de-emphasized technical skill and insisted upon the unbridled passion of its artists for what they were playing – deeming that to be essential proof that they were true believers in this revolt just as they, the audience, was shaping up to be. Bostic could deliver in both ways, skill and passion, and if not quite the true believer in the music as a whole he was certainly more than capable of convincing you he meant every honk, squeal and blast from his own horn in a way that many other recent arrivals from the outskirts of jazz could never quite pull off. It wasn’t that he was a charlatan or an opportunist who was cynically looking to exploit a new style that had yet to define its own parameters, but rather he was an explorer and it just so happened this was virgin terrain which by definition made it interesting to him. When that interest was returned however he had already begun to look elsewhere. Platter Poppa is “elsewhere” in many ways, taking attributes from rock for sure, the intro in particular is pretty aggressive at times, but combining them with far more milder explorations of melody, technique and mood to create something which doesn’t fulfill either aim. In the past Bostic has often been the only horn on his sessions but as of late he’s had reinforcements which might sound as if it were a good move, bolstering the sound while taking off some pressure for him to carry the entire burden, but he was so good that these other horns, needing to be given something to do, often weigh him down. Here what they’re playing is inconsequential sonically, at least in terms of adding something vital to the arrangement, and although they’re not heavily featured they give this the shadings of a milder jazz band being fronted by an escapee from a loony bin. As Bostic honks away in a frenzied dance, the rest of them stand astonished with their horns at their sides and their eyes wide with shock or maybe even terror before they finally decide to jump in and try and join him. Their collective sound though is thoroughly out of place and even though it’s rarely in the forefront their presence adds a layer of dross to this which permeates the entire record. It doesn’t help that the other most notable instrument, the one being relied on to carry the rhythm, is the piano. While that’s a versatile tool in the right hands, these most assuredly aren’t the right hands. It’s played with the appropriate dexterity maybe, but not the right intent. It’s flashy rather than substantive, and not even too flashy at that. What Platter Poppa needs is simplicity, dare I say even a less talented band, but guys who did one thing well and stuck to it like gum on the bottom of your shoe, rather than a more versatile outfit who probably looked upon their leader as if he were insane for playing so unhinged at times. Give Bostic a drummer who could just pound out a rhythm like his drumsticks were redwood logs and whose right leg had some violent spasm in it that caused him to repeatedly thump the bass drum like a mule kick. For the pianist find somebody who played crude boogies and let his left hand go to town while intermittently allowing him to add some showy passage with his right hand anytime Bostic needed a breather. For the other horns – if you must have other horns that is – make sure one of them is a baritone sax, preferably somebody who doesn’t feel it beneath him to blow one note, and one note only, for three minutes straight with all the lung power he possesses. If this hypothetical replacement band insists on carrying a trumpet player, maybe just to take along on the road with them so Earl can beat him at cards every night, then just give him one siren call near the opening and a few squawks in a break before holding one last note as they all bring things to a close and head to the bar when the session ends. No guitar necessary, no bass is even required if the piano player and drummer do their jobs right, and the trumpeter can double as their driver, treasurer and bottle opener. The band might not be better skilled than what he has here, but it’d be far better for achieving the sound we require in rock to be satiated musically. But even with all those changes it’s always going to be Earl Bostic himself front and center – on stage and on record – and though nobody ever doubts his commitment to what he’s laying down, he does need reminding from time to time of the goals these records should aspire to. In rock that means providing something exciting, yes, but also reasonably structured and sensible. That tends to be where Bostic has trouble, as he does with Platter Poppa. For one thing I doubt that if Bostic had been asked to perform this song again a day, a week or a year later he’d be able to replicate it in a way that would allow someone who knew the record frontwards and backwards to have any idea what he was playing. In other words this sounds like improvisation with only a sketch outline for them to follow. Yes, his playing is impressive from a sheer energy standpoint but I’ll be damned if anyone listening knows where it’s going… or even where it’s just been. Earl wanders around in the dark, a million riffs in search of a single song. The riffs themselves have the requisite drive and fury to be enjoyed, but because they stand alone, never tying in fully with anything else, they’re easily forgotten once they pass. Records can’t do that. Not then, not now, not ever. Repetition is one of the keys to success in recorded music, a way for the listener to latch on to a song and once heard they’ll be able to anticipate what follows and recall the hooks after it’s ended. Without that ability a song only exists in the moment and that’s when the environment you hear it in, such as a club late at night when everybody is three sheets to the wind, can elevate something like this to a level that it can never achieve in a neutral sterile environment. But of course a neutral sterile environment is the way most people listen to recorded music and thus those are they people you have to appease with these records. In that setting all of the high squeals, low honks, rapid fire runs, some climbing progressively higher until you’re dizzy, others just going around in circles, are impressive but utterly devoid of meaning. Once removed from the communal live setting it’d work best in there’s nothing to feel invested in as a listener and so inevitably Platter Poppa wears you out more than pulls you in. By its close you feel as though you’ve been beaten down rather than lifted up, you’re exhausted with little recollection of the enjoyment you’d normally have gotten from a song that wore you out. It’s not so much a knock on Earl Bostic the musician as it is Earl Bostic the bandleader and arranger. Hampered by his divergent aims and unfocused in his execution, the song shows just how hard it really was to conceive one of these supposedly indulgent rock instrumentals in a way that will allow it to hold up. Bostic may in fact be the father of the form in many ways, but like most patriarchs it’s only a matter of time before the kids grow up and take his place as the head of the family business. He’s still got the chops to more than hold his own, but until he regains his sense of purpose and buckles down to come up with something well-conceived before he even puts his lips to the reed, he’s going to find that for all of his ability he’s destined to fall out of step. 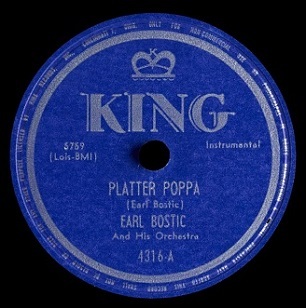 Leave a reply on "Earl Bostic: “Platter Poppa”"